This year we spent a month studying the life and work of Georgia O’Keeffe because an exhibition of her work was due to arrive at our local art museum. As soon as I learned that an O’Keeffe exhibit was due to arrive this year, I turned to one of our favorite sources for art curriculum: The Masterpiece Society. I decided to combine two art courses focused on Georgia O’Keeffe: the Art Appreciation course and the Mixing with the Masters Course. Turns out, they were a perfect pairing for a timely study of Georgia O’Keeffe’s life and work. After a week at the beach, our family was ready to ease back into school very very slowly. I knew that we needed to find our groove again, but I wasn’t ready to jump back into the entire usual routine. I needed something fun. something new. something enjoyable. That’s when I saw it online. A new video art course perfect for the summer. During our recent visits to the local art museum to tour the Childe Hassam and the Marks of a Genius exhibits, we stumbled upon an art conservationist working in the museum. Painting in full view of the public eye, she was set up in an area created for the public to explore the art of conservation. She immediately welcomed the kids and explained what she was doing. She mixes her own paints and described that process for them. The kids were invited to explore the back of the painting to see what she was working on and some of the problems caused by previous restorations before we knew what we know now. The artist was eager to discuss her artistic endeavours with the kids and answer all of their questions. My 11-year old, a budding artist, had a lot of thoughtful questions for her. I was excited for her to see a career option in art world, so we asked about college education requirements. This conservationist had both a chemistry and art degree! The area is set up to explore the science of conservationism, so she took us through the display and explained how conservationists record their work. Unfortunately, after some persistent digging and exploring the NC Art Museum website, I could not find this information advertised on their site. If you visit during the week (every Tuesday and Thursday from 10:30-11:30 and 1:30-3) then you will find that you pretty much have her attention to yourself. Thankfully she is also working on select weekends listed above on the sign. Around the corner from the conservation display is an area of interactive artwork. 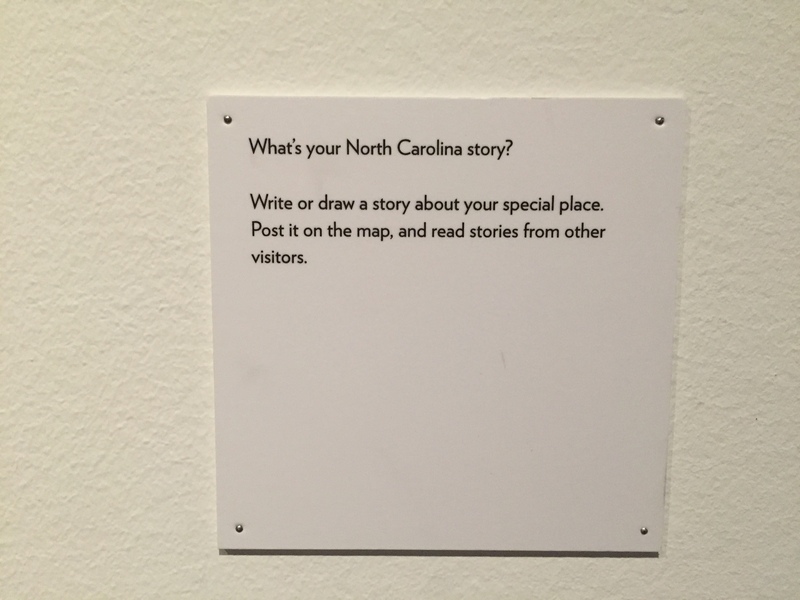 This map of North Carolina invited viewers to share their NC story on a post-it note and add it to the map. Then we shared our own stories. Interactive art is a lot of fun for the kids and a unique way to explore the art world. If you stop by this area of the museum, add your story to the map! Have you seen a conservationist at work? Included with your ticket to the Childe Hassam exhibit, currently at the North Carolina Museum of Art, is Marks of a Genius: 100 extraordinary drawings from the Minneapolis Institute of Art. The selection of drawings, watercolors, gouaches, and pastels dating from the Middle Ages to the present includes stellar examples by such masters as Guercino, Annibale Carracci, George Romney, François Boucher, Thomas Gainsborough, Edgar Degas, Käthe Kollwitz, Egon Schiele, Emil Nolde, Amedeo Modigliani, Henri Matisse, Alfredo Ramos Martínez, Roy Lichtenstein, and Ed Ruscha. This eye-opening exhibition illuminates the historical and ongoing role of drawing as a means of study, observation, and problem solving, as an outpouring of the artist’s imagination, and as a method of realizing a finished work of art. The sketches by master artists available for viewing were astonishing to me. Really? I can just walk on into this exhibit and snap a photo of a Picasso? Yep. With the flash off, you are allowed to snap photos but you can not sell them. This is the sort of exhibit that allows you to see a variety of drawings by many master artists through history. We walked through the rooms and discussed drawings that caught our eye. Occasionally I threw out questions to engage the kids in the artwork. Is there a drawing here that depicts anger? love? joy? Where do you see texture? What do you think they feel like? Which sketch is your favorite in this room? What do you like about it? Overall, we had already spent about 15 minutes in the Hasaam display so the kids were able to engage this display for about 15 minutes more. Six year old children, at least in my experience, have a tolerance of about 20 minutes or less. My 13 year old feels the same way. I believe I got away with 30-35 minutes because the two exhibits were so different. Of course, if you have an child who is interested in art, you might be able to meander for a longer period of time. My 11 year old now appears to be one such child so I will have to work out extended visits for her somehow. It is well worth the trip to the North Carolina Musuem of Art for this exhibit. Be sure to stop by before the last day on June 19.